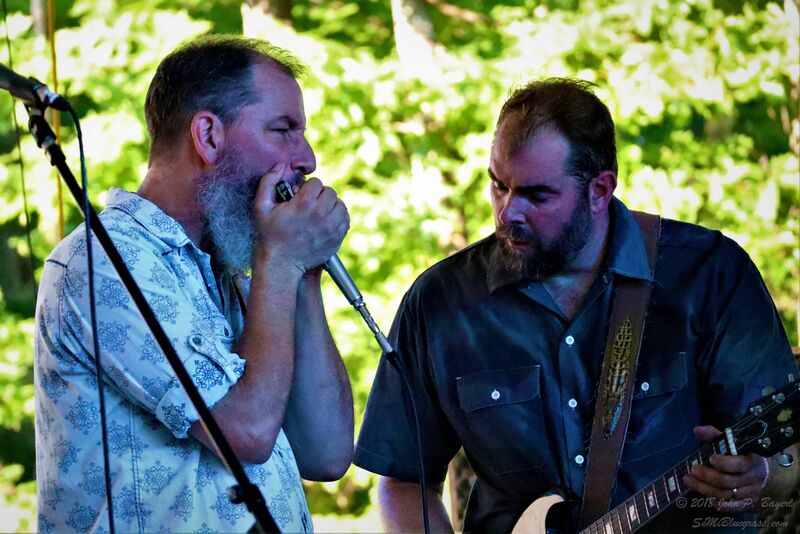 Andy Langlois (R) Gettin' Down on the "Bear Cave Stage"
When Andy Langlois and David Manson, Co-Owners of Blackrocks Brewery in Marquette, throws a "little party in the woods", watch out...you are in for a special treat. 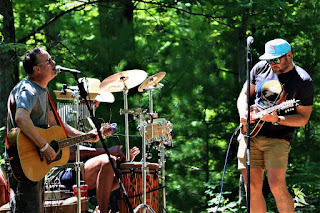 The Forestville Music and Beer Festival (a fundraiser for the Noquemanon Trail Network) has become an annual tradition and is evolving into a unique and special event. 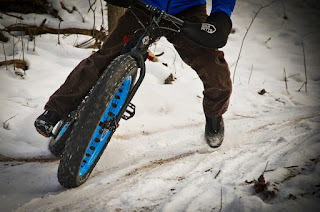 The NTN's mission is to develop and maintain an interconnected, year-round, non-motorized land and water trail network in the central Upper Peninsula of Michigan. It is apparent that they are not happy with "good enough" as they provide literally hundreds of miles of top-quality, multi-use trails for hiking, Nordic skiing and mountain biking. In fact, their single track mountain bike trails are open year-round and have contributed to Marquette's reputation as the "snow bike capital of the world". 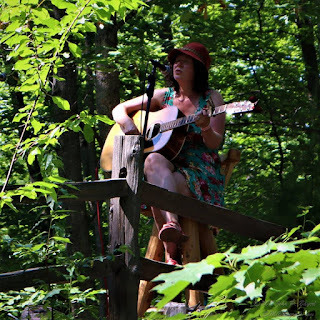 This music festival, aside from all the fun, is a major fundraiser for the network with 100% of the profits going towards the creation and maintenance of the trail network. 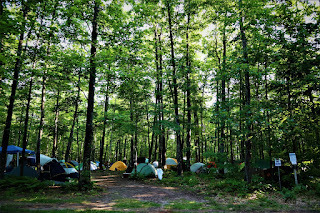 Located just northwest of Marquette, the festival takes it's name from the Forestville Trailhead, which provides a sunny, grassy area for the stage, as well as plentiful shade in the adjacent woods allowing for comfortable, though primitive camping (tents only, no clear sites, no power, etc.). There is limited RV and camper parking available in the parking lot (again, no hook ups). Due to the remote location (and use of the parking lot for camper parking), access to the festival for non-campers is via frequent shuttle bus runs (also a stroke of brilliance for a beer-centric festival--no worries about guest over-sampling the wares and then getting into a car to drive!). Many festival goers also arrive on mountain bikes (since this is the trailhead of one of the premier mountain biking trail networks in the country!). The festival's sometimes tag line "eight breweries, a dozen bands, thousands of trees and millions of stars" pretty perfectly sums up what to expect at the festival...though it omits "and hundreds of new and old friends". Craft beer and music are inextricably intertwined--especially in the booming Michigan scene--and no where is that more apparent than this festival. Hosted by Blackrocks Brewery, you will also find a rotating assortment of Michigan Craft Brewers showing off their latest product (and often a special brew just for the festival). This year, Shorts Brewing (Starcut Ciders) Company, Cognition Brewing Company, The Mitten Brewery, Ore Dock Brewing Company, and Bell's Brewery were all in attendance and brought their "A" game with some delicious offerings. 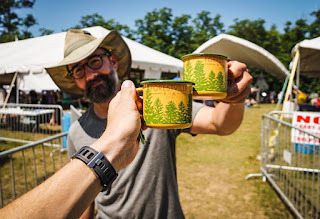 The festival strikes a reasonable balance between "party" and "responsible" drinking with a generous 10oz pour for only $2.00 (or 12oz with a souvenir, hand-painted, enameled mug hand-crafted in Poland). Coupled with the reasonable weekend price (roughly $50 for music, beer and camping) this may be the best festival/entertainment value of the summer. And Oh! The Music! Featuring some incredible local and regional artist, Forestville boasts an eccentric and eclectic mix of music guaranteed to entertain and get the crowd up dancing and singing along! Weekend campers are treated to a special Friday night "bonus" set each year, accompanied by some special beer offerings from each of the brewers. 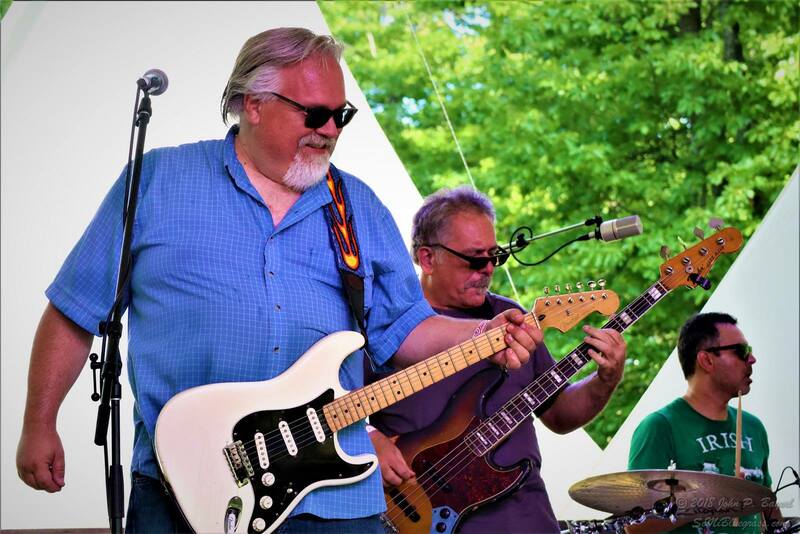 This year, long-time Marquette staples the Flat Broke Blues Band brought their mix of Chicago Blues and Soul to the stage to kick off the festivities. Powered by the lush vocals and swampy harp licks of lead singer Lorrie Hayes and prodigious blues licks of guitarist Mike Letts, and backed by the killer rhythms of Walt Lindala (guitar), Mark Johnson (bass) and Jim Cohen (drums), the FB3 crew got the crowd up and moving and set the bar high for the rest of the festival. Friday night closed out with a long, sweaty and ultimately danceable set from blues-funk fusion and party rock band Frank An Da Beanz (as close to a house band as Blackrocks has). Clad in outfits (semi) appropriate for the sauna-like humidity and temperatures (shorty-shorts, kids rompers and classic rock tees...) the band took the stage behind frontman/bassist Evan Simula, threw the set list out the window and launched into nearly two hours of high-energy, fun-filled and funky jams. At first I was disappointed at the mere one hundred or so people crowding to the front of the stage...until I took a little walk around. There were another couple hundred people dancing and grooving under the merchandise/beer tents...and a similar number rocking out in the front-stage camping area. I found another couple hundred people enjoying the music from their parking-lot RV Campsites and in the backstage tent "village". As a testament to Jim Suppanich and Sombrero Sound Company's, skill, the sound was excellent over the entire grounds--I was able to hear each instrument, each note and each voice distinctly and clearly--a feat made even more unbelievable by the fact that you could hold a conversation comfortably at the sound tent, 100 feet from the stage and right between his two massive, twenty+ foot speaker stacks! The soaring, parabolic sail-influenced main stage, with sound by Sombrero Sound and an impressive light display featured a jam-band heavy rotation of high energy acts. 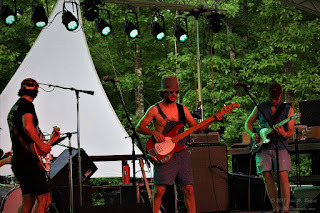 Kicking off the day was the best pure jam band of the weekend, Not Quite Canada. Featuring funky bass lines and rhythms complemented by some heavy guitar lick, smokin' synthesizer works and over-the-top saxophone leads, the band kept the crowd buzzing and sweating for over an hour. 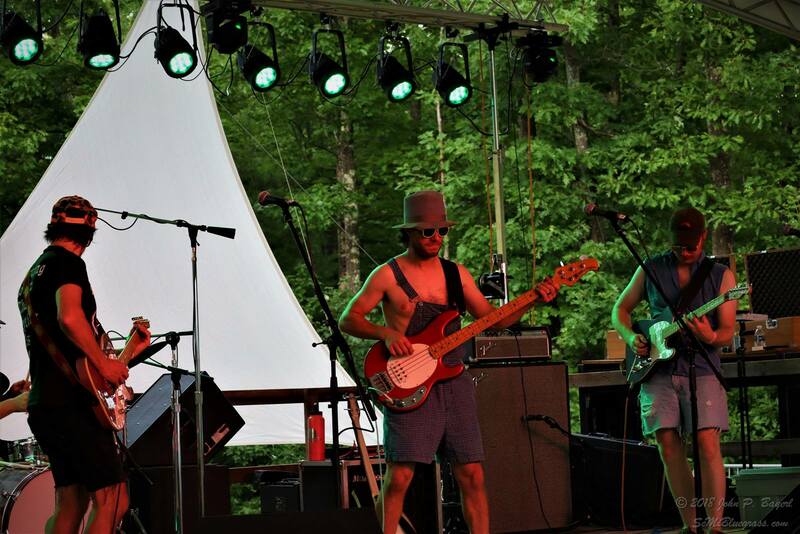 Their original tune "Smoky in the Sauna" brought a smile to everyone's face with it's infectious groove and lighthearted lyrics. Chasin' Steel has been entertaining the Marquette faithful for seventeen years with their unique take on "bluegrass with a rock-n-roll attitude" and did not disappoint with their high-energy, driving set list. Regional jam bands After Ours and Public Access followed with high-octane, effects driven and complex jams to keep the energy high. Speaking of "high octane", the Organgrinders followed with their usual funky, cool, groovy, and eminently entertaining set of swampy, gritty blues and "TEAM DRINKS"! They continue to be the best party band around, killer musicians and some of the nicest people you will meet! The Scott Pellegrom Trio closed out the night with an incredible set of mostly instrumental, jazz-influenced rockers. As has become a tradition at Forestville, after the final bus departed with the day-ticket crowd, the campground crew congregated by the information tent as Andy set up a small PA and called to the crowd "here's your chance...if you're a musician and always wanted to play at Forestville...I've got a microphone, a couple guitars and a mandolin...step right up!". And so began an epic jam session lasting well into the night and featuring a mix of original music and covers ranging from pop to reggae, progressive rock to classic funk, country to rap. The talent the oozes out of the Marquette crowd continues to amaze me. Certainly one of the coolest features of the jam was Andy's personal Taylor guitar. 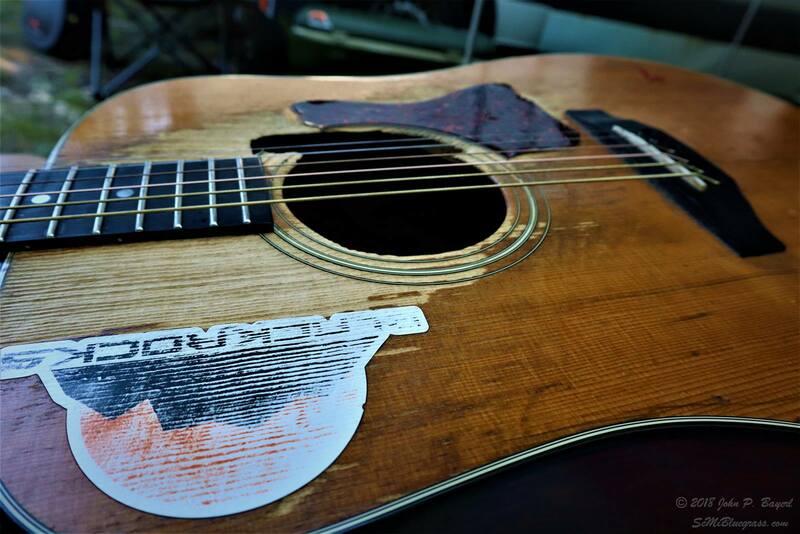 Having hung on the wall of the brewery for the past ten year, and played by college kids, amateur and professional musicians, and assorted alcohol fueled troubadours, this guitar--well worn, beer-soaked and battle scarred--has managed to soak up some serious musical mojo, sounding like a million dollars in the hands of every musician who plays her. I will write a full post about this guitar some day, as it's definitely something special. 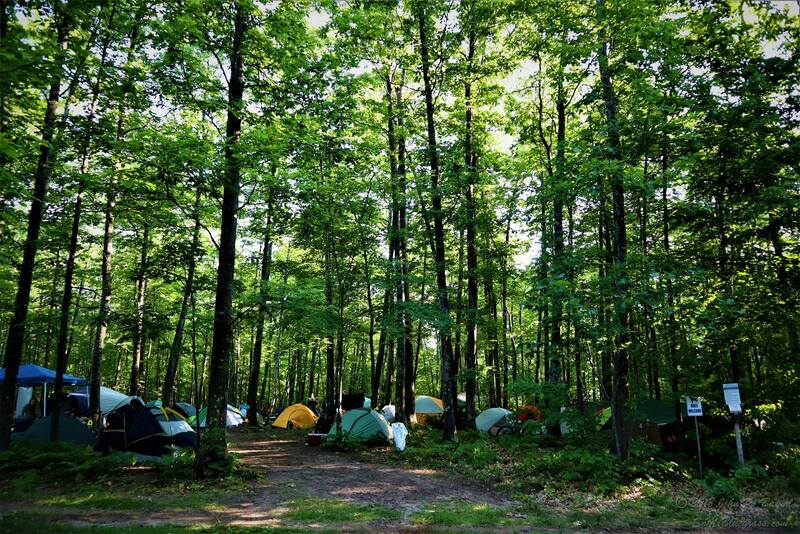 So, for another year, I must bid farewell to my beloved "home away from home", Marquette, Michigan and a truly spectacular "party in the woods", Forestville. Until we meet again! Like what you see/read? Subscribe to SeMiBluegrass.com or find us on Facebook.